I’ve baked only a few times during the last year even though baking is one of my favorite things to do when I’m by myself and I find it utterly relaxing. But all kinds of goodies requiring an oven have been kept to the minimum as I’ve had to work with a combination of microwave and an oven. Apparently Dutch apartments are into those combi ovens and I found those slightly challenging. And even more annoying. To recover from this kind of 10 month tragedy, tough measures aka lavish baking is needed. During the last moths I’ve been saving all kinds of recipes that I thought I’d try as soon as we were back in Finland. But then the heat wave struck us. And I loved it. I ate piles of strawberries and craved smoothies. I stayed far away from the oven, even though I was thinking about all the things I wanted bake. So when these rainy and slightly chilly days arrived, I was secretly a little happy, put on my apron and finally started to bake. Ah, what a wonderful feeling to put the oven on, get all the measuring cups out and mess up the kitchen table (and floor) with flour. I started my return to baking with homemade focaccia, which was actually one of my favorites before I was diagnosed with celiac disease. I love all kinds of Italian breads filled with tomatoes, herbs and maybe some cheese, artichokes or bell peppers, but haven’t been feasting with them that much during the last years. 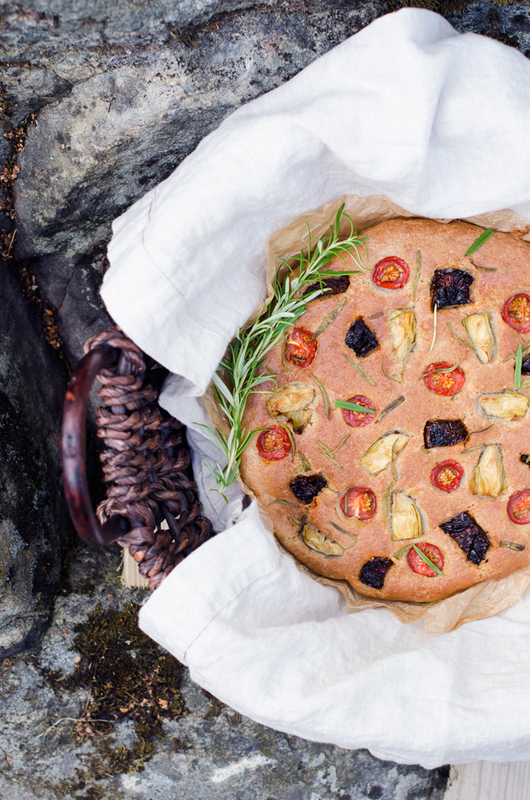 So when I found a recipe for a gluten free oat buckwheat focaccia from Outi Rinne’s new cookbook, I almost squealed with delight. I knew that I had to test it right away. notes: the original recipe had tapioca flour but I used potato starch instead, which worked well too. also, I didn’t have any xanthan gum so I just skipped it. 1. Whisk in a large bowl water, psyllium, yeast and honey. Stir together different flours (+ xanthan gum) and salt in another bowl. Mix the dry ingredients to the liquid together with the olive oil. Mix until smooth. The dough can be quite runny, like a muffin dough. Cover the bowl and put to a warm place to rise for 30 minutes. 2. Line a 26 cm diameter round cake pan with a baking sheet. Cut the cherry tomatoes in half and chop sun-dried tomatoes and artichokes. Pour the batter into the cake pan and shape with a spoon or by hand into a flat bread. 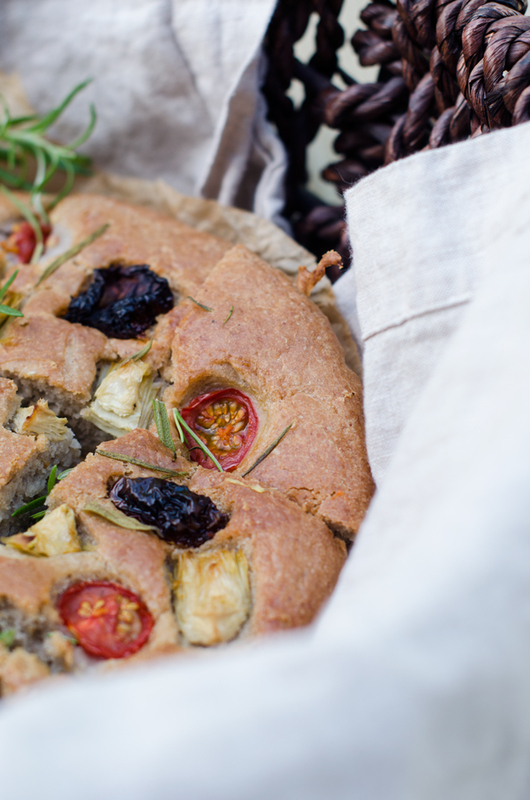 Press small holes with your fingers and put cherry tomatoes, sun-dried tomatoes, artichoke and rosemary to the holes. 3. Transfer the bread in a cold oven and put the oven to warm up to 190 (fan-assisted oven 175) °C degrees. Bake for about 45 minutes counting from when the oven has heated up. The bread is ready when it has a nice golden brown color. Set the baking paper on the rack to cool. Cut into squares, serve and enjoy! Tagged baked goods, bread, focaccia.